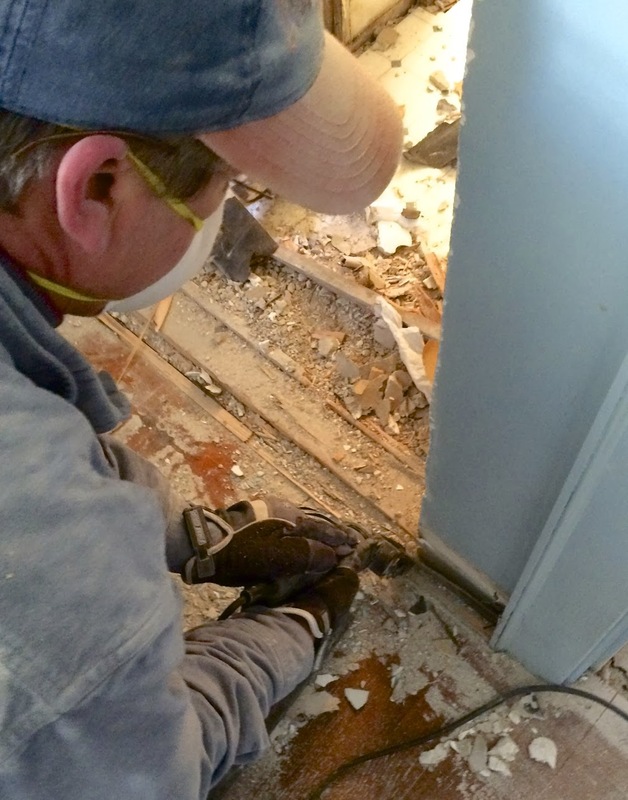 Okay, so I'm not talking about the usual stuff….hammers, drills, saws, etc. I'm talking about a couple of tools that we've discovered in the last two years that have made our life MUCH easier. First, the laser level. Like lots of other folks, we have levels of different sizes that get used for lots of tasks. But once we discovered the joy of a laser level, we find we use it a LOT. 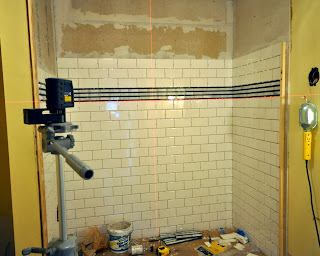 The most obvious place to use a laser level is to install kitchen cabinets. 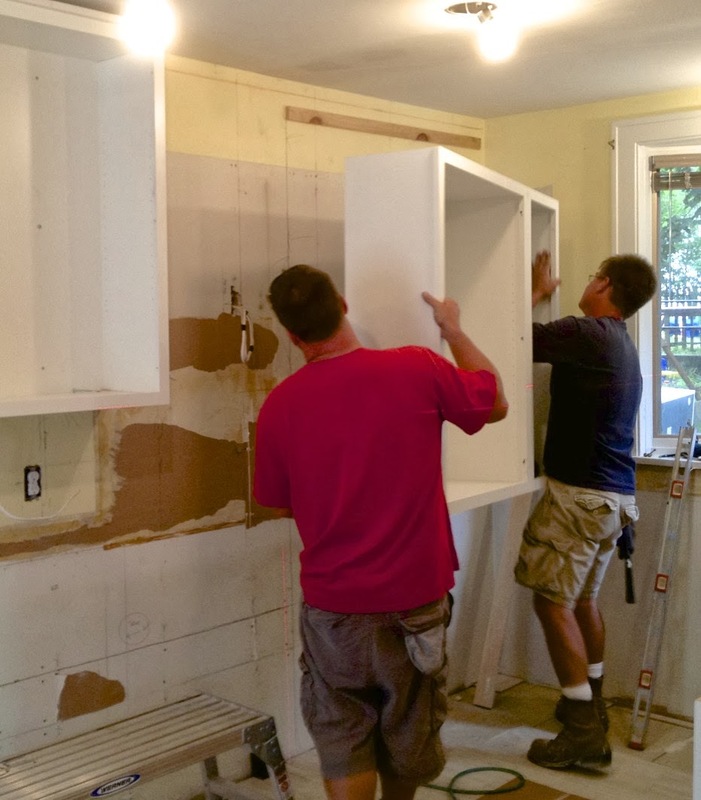 It quickly helps you determine the high/low point in the room, so you can define where to start placing your cabinets. And of course it helps you constantly check your level during the installation process. But I quickly found lots of other uses for it. One of my all time favorite projects was painting the staircase on our first project (click here for photos). 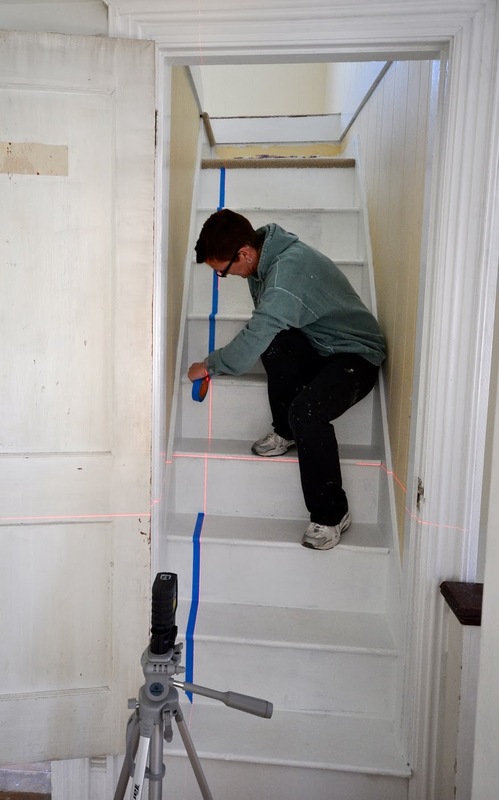 The laser level let us quickly tape up the steps and get the project moving quickly. 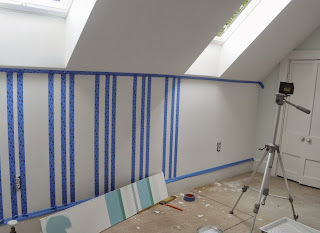 Since then, I've used it for any unique taping project - the nursery in our last project was done in half the time it would have taken with an old fashioned level or plumb bob. 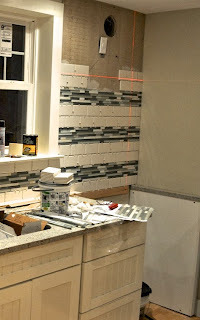 My other favorite use - installing tile. I love installing bands of special tile. But it's critical to have these perfectly level. 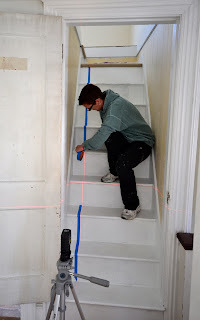 The laser level lets you do that with ease. WARNING: it can let you become a bit obsessive about keeping your line exactly level. There are times when I know I ripped out a line of tile for a fraction of an inch difference, that no one but me would ever notice! We have a Bosch Cross Line Leveler. It works beautifully, but we were cheap and in retrospect, I wish we'd bought the next higher level model which also provides a plumb laser. This is a fantastic tool when you're doing things like trying to mark the center of the ceiling for a light fixture. A critical accessory for a laser level is a tripod. I use an inexpensive Targus tripod that I bought at Target. Again, in retrospect, it would be nice to have something a little more rugged. And at some point, I'll need to upgrade. The other tool that I don't think we could live without at this point is the 'Fein' tool. Developed in the 60's by the German Fein company, this oscillating tool was used for removing plaster casts when a broken arm or leg had mended. Its oscillating blade wouldn't cut skin, but would cut right through a cast. 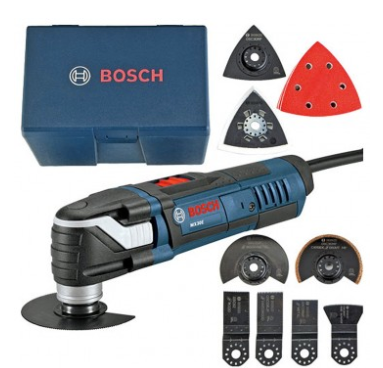 Today, many companies make their own version (ours is a Bosch) and they come with a variety of cutting blades, sanding heads, etc. It's the perfect tool to cut off a bit of trim, cut off a broken fastener, or undercut a door frame. For example, when the granite installers discovered we had a section of 2x4 sticking too far out of the wall, I was able to quickly cut it out of the way, so that they could continue with their installation. A couple of bolts sticking out of the wall? Cut them right off! They have plunge cut blades, scraping blades and grinder blades. And they all work beautifully. The only thing I'm not crazy about is the sanding accessory. I've used it a few times, but haven't found it quite as useful - the sandpaper just seems to vibrate off! So, I'm curious. 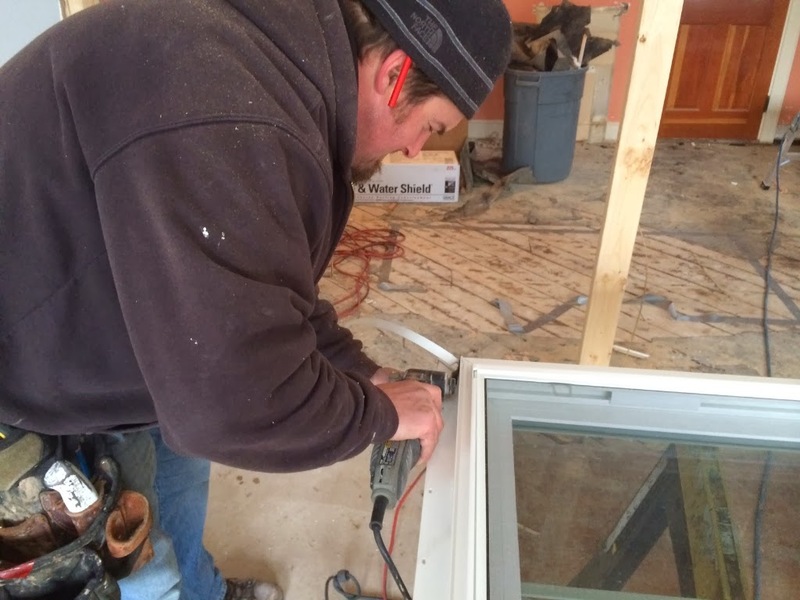 Are there tools that you've found incredibly helpful in your renovation projects? I'd love to find some more time savers!! my friend taught me that a good way to buy tools is to go with a cheapish version at first. when you realize that its used a lot or breaking, then replace with a high end tool. i like having a 'rule' as i have had a lot of anxiety about tool pricing and quality in the past. Wow, that's really great advice! And your'e right, we've bought some really expensive tools and then found we didn't really use them. So this is a nice guideline. Thanks so much for sharing!!!! I couldn't do anything without my air compressor & nail guns. I have no hand strength so I usually pound on a nail so many times it heats & bends. Plus it's just me building everything so I need a quick punch to hold things up until I can go back & screw them in or pre-drill for a larger nail. I love to see unique tools with a design that perfectly meets a need. I really prefer a nail gun…..but it's mostly because my eye/hand coordination is so pathetic. Ha ha. But you're so right, it makes things go so quickly! optical device tools are effective, easy-to-use, and reliable, victimization target-hunting beams of sunshine to realize a degree of exactitude no tool will reach. and therefore the better part is that they will not break the bank - optical device tools are comparatively cheap and might even be found as discount tools.